Easy, decadent and perfect for dessert, these Chocolate Granola Pancakes are a Pancake Day (Shrove Tuesday), or any day, treat. Easily adapted for gluten-free and dairy-free. I have lived in the UK for many years, adapting my palate to my adopted island’s produce and serious love of global cuisines – the latter about the only good thing coming from its colonial past. Other than the rich and complex curries, one of the first things I appreciated here were the thin, crepe-like pancakes. It took me ages to get my head around producing these light, foldable pancakes: Getting them on the plate without tears (in both senses of the word) was quite a feat for a klutz like me. It took me slightly longer to appreciate the whole lemon and white sugar thing. No maple syrup. No side of eggs and bacon (which now seems seriously weird to me). But what I realised was that outside of the hullabaloo of Shrove Tuesday, pancakes were a relative rarity. And not really for breakfast. You saw them on dessert menus (and still do), origami-like and served with Nutella. But no one seemed to make them at home. I think that has changed now, but pancakes are still seen as an American thing. And as I am American I feel I can have some authority – however unearned – on the subject. Our pancakes are just that, cakes made in pans. But mostly they come from a mix these days. When I first moved here I brought popular brand Bisquik, thinning the batter down to approximate a British pancake. I am happy to say that I no longer have a box of Bisquik, preferring to make my own mix that I change according to how we wish to eat them. Mostly I make savoury pancakes, wholesome ones made with chickpea flour, or yellow pea flour (Hodmedods is great for the latter), topping with seasonal spiralised veg, and maybe an egg. But when going for sweet they are for dessert or a decadent brunch. And this one is no different. It is decadent. It is dessert. It is damn delicious too. Normal nutritious service will resume next week. Until then, enjoy the temporarily off-message Food To Glow! 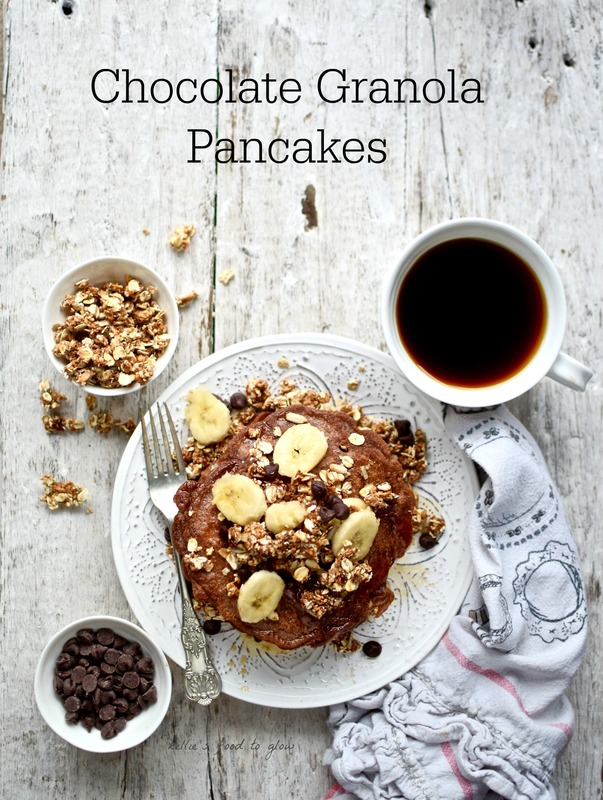 Easy, decadent and perfect for breakfast, dessert or brunch, these Chocolate Granola Pancakes are a Pancake Day (Shrove Tuesday) – or any day – treat. Easily adapted for gluten-free and dairy-free. Dry whisk the dry ingredients in a large mixing jug. In another jug whisk the milk, egg and melted butter. Make a well in the flour mix and tip in the liquid mix. Mix until the flour just disappears, then fold in the granola. Heat a scant amount of oil in a large frying pan over a medium heat, just a thin slick. Use an oiled piece of kitchen paper if you wish. Pour in enough batter to make two or three pancakes, according to the size of pan you have and the size of pancakes you wish to eat. Cook until bubbles dot the surface and the sides are starting to dry. Carefully flip, cooking until golden and cooked underneath. Care on with the remaining mix. Keep cooked pancakes warm in a low oven if you like. Layer up the pancakes with the toppings/fillings and enjoy immediately. And you will! Oh I do love chocolate chips in pancakes, so you’ve won me over with this full on-chocolate pancake recipe! I make nut butter banana griddle cakes and have to admit I enjoy them for breakfast. 😉 Thanks for the occasional off-message posts Kellie. They’re fun! omg…I need to go home and make this right now. LOOKS SO YUMMY! Oh my god these look absolutely delicious! These look utterly divine! I could just gobble these up now. 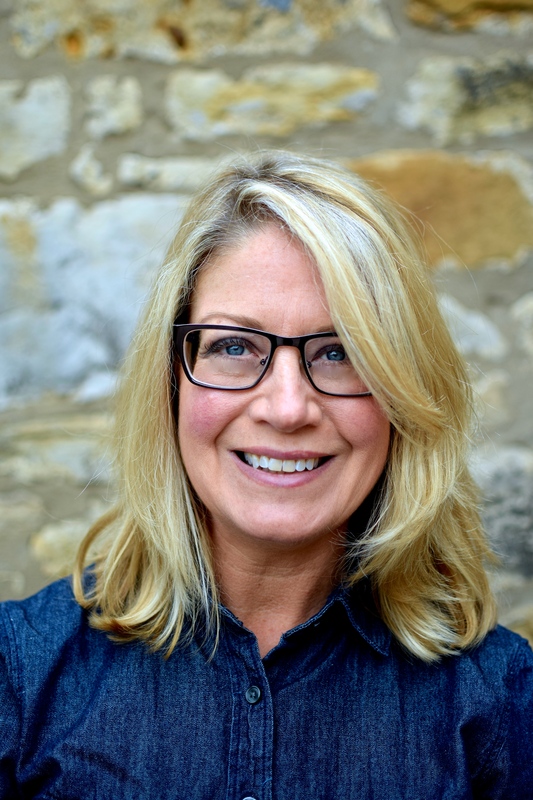 I make pancakes for breakfast every morning…when my daughter was diagnosed with coeliac disease it was a way to fill her up (she was always hungry) and get some protein into her…otherwise she would devour 5 bowls of rice crispies! We never have pancakes therefore as a pudding…apart from on pancake day. So next week will be the exception and the kids will be allowed to put sweet treats on top! These look so incredibly delicious. Wish I could race into my kitchen right now and make them! The pancakes look so divine! Yay! These look gorgeous and I reckon I may have an all day pancake day next Tuesday starting with these for breakfast! I have just started exploring cooking with buckwheat flour so excited to find your recipe combining it with one of my favourite ever eats aka pancakes. What fun idea to add granola. Crunchy pancakes are a new concept to me, but I like it. I’ve always made them, but you are right we have a flurry on the run up to Shrove Tuesday then it slows down and we forget. I think to be honest we eat so many on the run up to Pancake Day we scunner ourselves and don’t want them again for a while. Your pancakes look wonderful. Thanks for sharing mine too. We have lots of pancakes in our house – my husband being Canadian they are of the fluffy ‘American’ style rather than crepes. Although we love both! These look so delicious and I bet the granola adds a lovely texture. Wow these look perfect Kellie! Love them. I am guilty of only usually making pancakes for pancake day, but I think they should become a weekend treat with loads of berries. Will give these a try! This recipe looks amazing, definitely need to try this!! Beautiful stack! I am such a sucker for adding some crunch and crispiness–aka granola–on top of all of my breakfast food, including pancakes! Being a chocolate addict myself, I TOTALLY approve. Oh my gosh wow! And your photography is amazing!